We’re back and we’re cocking our hats, lighting some torches and wondering where the hell all these snakes came from. Why did it have to be snakes? 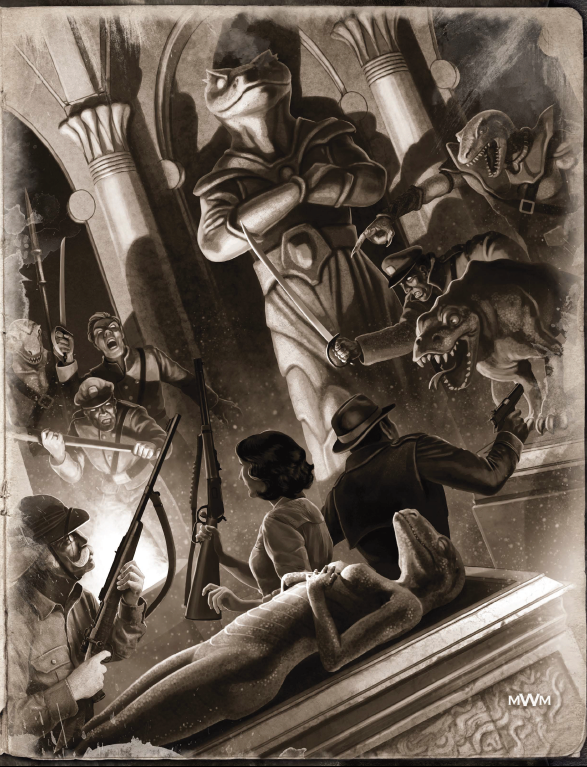 This is our look at how we developed The Two-Headed Serpent, the epic Pulp Cthulhu campaign published by Chaosium. 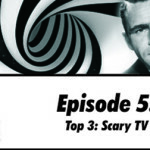 Appropriately enough, this episode serves two purposes. 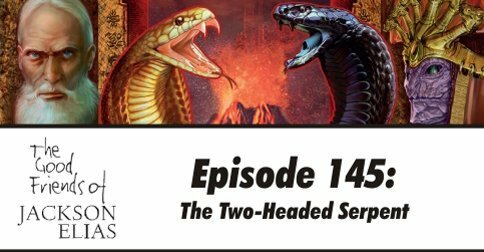 As well as offering insights into The Two-Headed Serpent, we also talk about how we put the whole thing together. 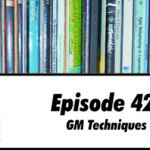 A few listeners have asked us for advice on writing campaigns and we thought we’d use this episode to explain how we do so. We spell out our development process, from initial concept to editing. Obviously, not everyone who writes a campaign does so for publication, so we also offer some advice about less formal approaches. Obviously, this discussion includes spoilers. We’ve tried to keep these to a minimum, however. 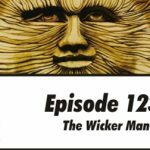 You could potentially listen to this episode and still play The Two-Headed Serpent. We give away a few plot points, including one major reveal, but leave plenty of surprises that could bite unsuspecting pulp heroes. 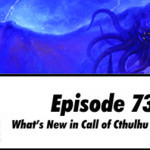 If you need a refresher about what Pulp Cthulhu is and how it differs from Call of Cthulhu, you may find our episode on the subject useful. 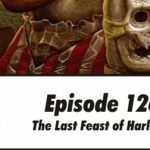 And if you’d like to hear what The Two-Headed Serpent is like in play, Scott is currently running it for the How We Roll podcast. 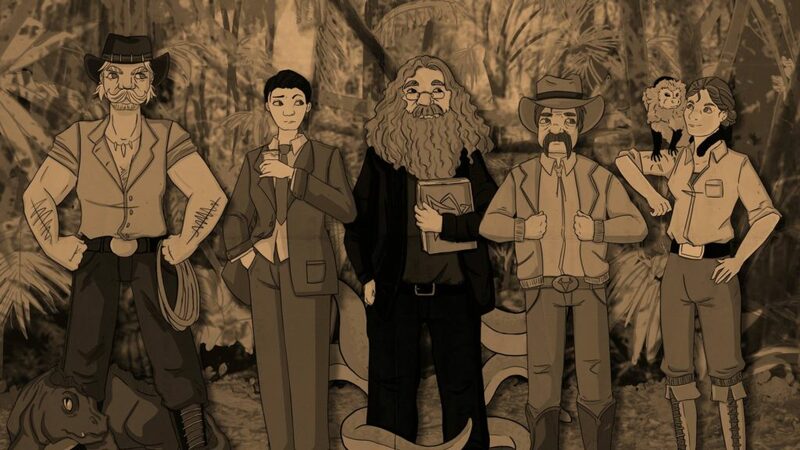 Rachael Tew’s rendering of our doomed brave heroes. Our good friends at Torchlight Candles have sent us something unusual. Few things we receive in the post are quite so fragrant and most are decidedly less odd. 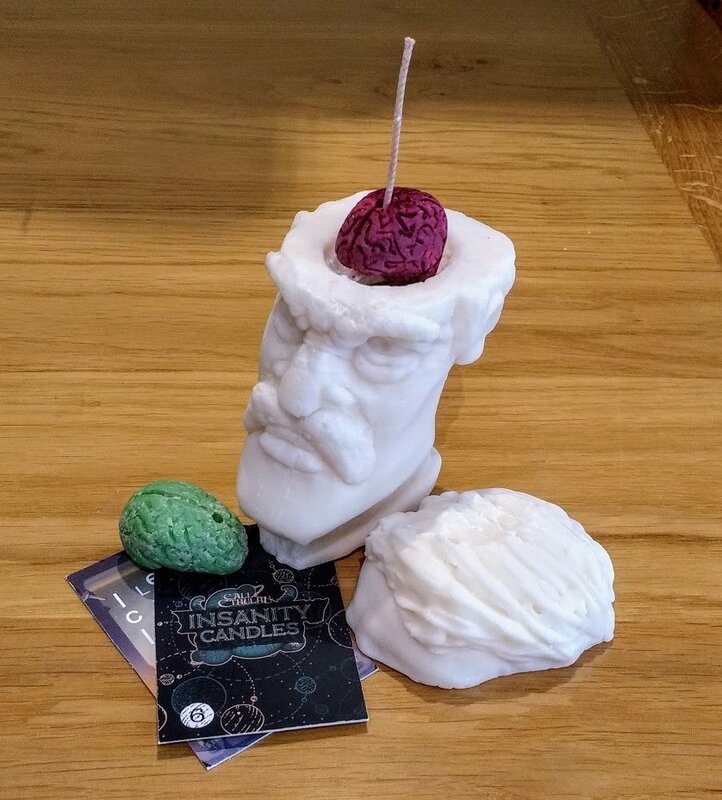 The Insanity Candle is a uniquely pyrotechnic way to track Sanity in Call of Cthulhu. By planting a scented replica of your investigator’s brain in a wax head, you can track SAN loss by melting it. 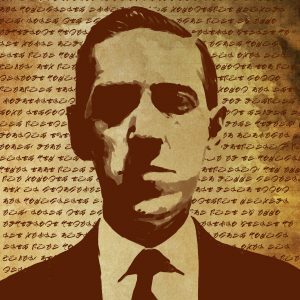 As a bonus, once your investigator has been reduced to a puddle of maddened goo, you will find a secret message hidden in their remains. 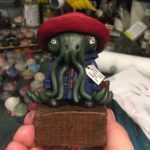 This may be the strangest Call of Cthulhu product that Chaosium have licensed. 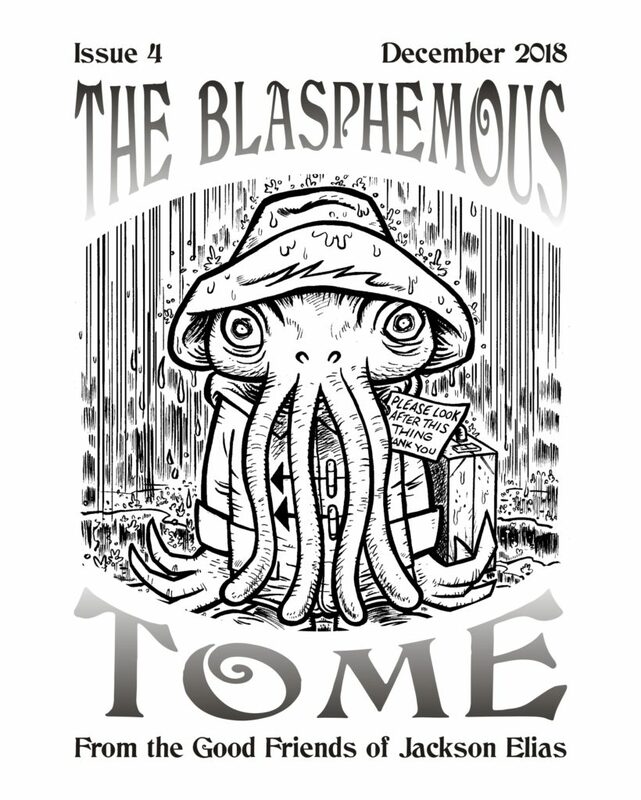 As you may have heard us mention once or twice, issue 4 of The Blasphemous Tome is now out. We’ve released our first batch into the winds like so many playful nightgaunts. Many have found their targets, bringing glorious nightmares with them. It’s not too late to get your copy, however. All you have to do is back us via Patreon by the end of the year. Full details can be found in our recent post. 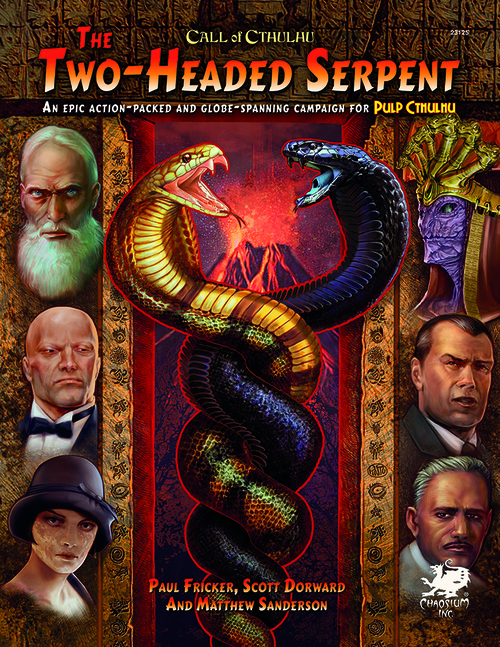 Our good friends at Chaosium have generously provided us with a copy of The Two-Headed Serpent to give away to one lucky listener. We’ve decided to hold a slightly different competition than our usual lucky dip based on social media shares. 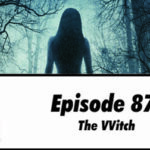 Of course, if you’d still like to share this episode, we shan’t complain! Full details of the competition can be found towards the end of the episode. Greetings! When writing such a massive, globe-spanning campaign as Two-Headed Serpent (or Masks), how do you avoid laying the tracks for a railroad? It seems sandboxing would be an awesome feat for the writers. and an arduous task for the Keeper. 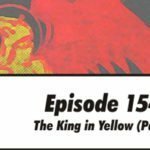 As always, excellent episode. I always greatly enjoy listing in. Writing a campaign for publication is a delicate balance. There will always be certain elements you want to bring into play, from set pieces to a big climactic scene. Putting those in the path of the player characters involves some form of direction. 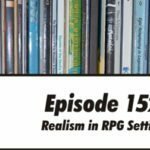 At the same time, you want to allow the players to make meaningful choices. The trick, as I see it, is to provide alternatives for when the players don’t take the path you’re expecting. Whether this means providing a modified version of an encounter or a completely different path, the important thing is that the Keeper has something they can use. This is probably the hardest part of writing a campaign like The Two-Headed Serpent. Hey! I love your podcast, it’s really helpful and entertaining. 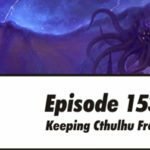 I’d love to hear a show about being a keeper for Call of Cthulhu, with tips and resources for narrations, and so. 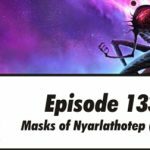 I know this has been covered here and there, but I’m talking about a whole episode just about that. I’m against animal cruelty, as I am against guns and violence, but we’re talking fiction here. He is Antoñete, a spanish bullfighter. During the 30s and 40s there were quite a few bullfighters that trascended their world. They were also celebrities who married movie stars and were invited to high society parties. Antoñete is one of those. He’s handsome and skinny, with pretty high dexterity and appearance. 30 years old, has traveled all around the world, he can communicate in a few languages, although not very well. He’s really charming and can get almost anything he wants with his seducing smile. He’s good with a sword in his hands and those years in front of bulls made him really proficient in dodging. In terms of gameplay, I’m thinking in sort of an acrobat mixed with an artist (actor) as for the occupational skils: Charm, 2 other languages, Acting, Dodge, Fighting (sword), Persuade and Jump. That’s an interesting idea about how to be a Keeper. 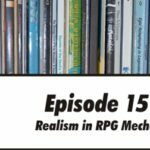 I’ll discuss that with the others and see if there’s enough stuff that we haven’t covered in other episodes that we could bring to the discussion. Thank you, Hector! We’ll have a think about how we might be able to approach the topic of being a Keeper. That’s great! All of the old and new keepers should learn from the masters!